Does the Endangered Species Act protect too many species? The Endangered Species Act (ESA) was signed into law with wide bipartisan support in 1973 and is arguably one of the most influential environmental laws in U.S. history. However, recent political debate has raised the question of how we measure its success. Critics say the act is ineffective because so many species remain on the list, but supporters say that is exactly what illustrates its enormous success. Critics see the number of listed animals as a backlog, evidence that the law hasn't been effective at recovering species. Supporters see the number of listed species as a triumph, preventing the extinction of more than 99 percent of those listed. So why are so many species still on the list? Humans are altering ecosystems—contributing to habitat loss and climate change, among other things—more quickly than many species can adapt. Research indicates that current extinction rates are accelerating and now may be roughly a thousand times greater than the rate at which species would go extinct without human influence, known as the background rate. From the scientific perspective, it’s a surprise that the ESA list isn’t growing more quickly. Some scientists have even concluded that we may already be amid the sixth mass extinction since the beginning of life on Earth. If current trends continue into future decades, half of the planet’s species may be on the path to extinction by the end of the century. When a species is listed as endangered or threatened, the U.S. Fish and Wildlife Service must first work to understand what specifically is causing the decline, a process that can take years. Only after threats are identified can the agency collaborate with partners, like landowners and local agencies, to recover populations through habitat restoration or captive-breeding programs. Therefore, the time it takes for an individual species to rebound is unpredictable and can be lengthy as conditions change and new threats emerge. 1. Species reaches goals specified by a recovery plan, such as self-sustaining populations or improved habitat quality. 2. Biologists determine whether the species still needs protection by assessing key threats to its livelihood, including predation, disease, and man-made factors. 3. Biologists solicit opinions from independent scientists, federal and state agencies, and the public, after a status change is formally proposed by the Fish and Wildlife Service. 4. Species is removed from the ESA list or downlisted from “endangered” to “threatened,” if no contradicting information is offered. Researchers continue to monitor the species. Species can be delisted or downlisted for other reasons, such as the discovery of additional populations or the species' extinction. Legal obstacles, reproduction rates, and the number and complexity of threats can affect how long it takes to fully recover and delist a species. Some species, like the Channel Islands fox, needed just one to two decades to get off the list. Others, like the California condor, will take much longer to regain a sustainable population. Grizzly bears fall somewhere in between. Habitat loss and aggressive hunting over the course of two centuries shrank their North American range and decimated their numbers. In 1975, they were declared threatened in the lower 48 states. 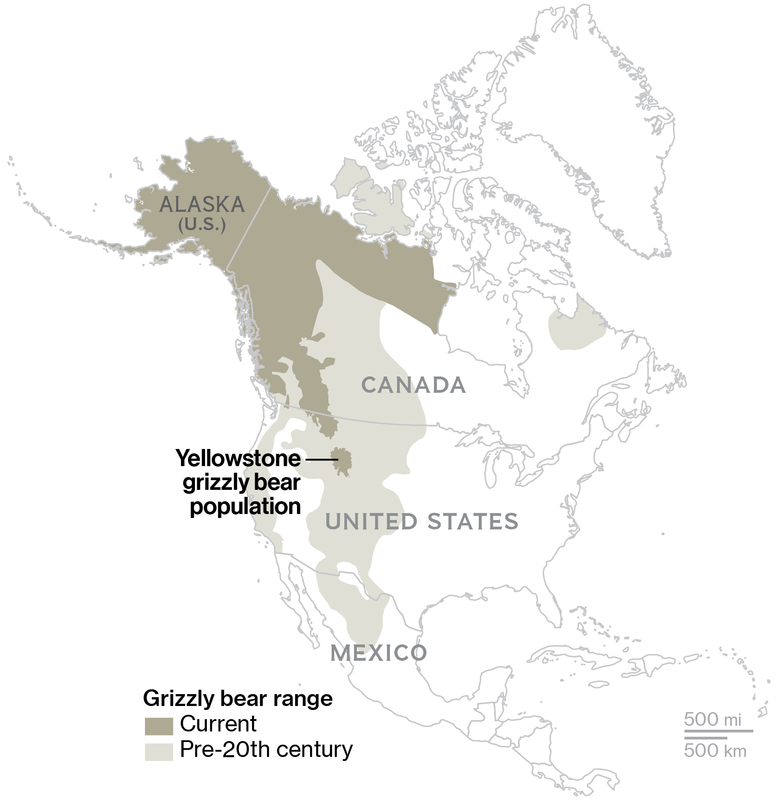 Before protection, the range of the grizzly bear had receded almost entirely from the contiguous United States. Now, however, populations in Yellowstone have recovered, prompting the Fish and Wildlife Service to propose delisting it. After the grizzly populations in Yellowstone rebounded, Fish and Wildlife Service biologists twice proposed delisting the bears. But conservation groups and wildlife biologists claim the agency is underestimating the threats of climate change and habitat loss. The bears’ protection under the ESA continues to be a matter of intense debate. Some critics of the ESA say that more could be done to integrate economic interests with conservation goals. Others argue that more should be done to strengthen the law or to ensure that species don’t need to be put on the list at all. What is sure is that, without protection, the some 1,600 species the ESA lists—plus potentially thousands of others not yet on the list—may face the very real threat of extinction.